These panels, 100 feet up on top of a Ponderosa Pine, help power my office/studio. 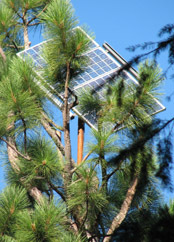 Local World Productions studio is powered by solar panels mounted high in Ponderosa and Sugar Pines. It's owned and operated by me - Jim Miller. I design and deliver information, media, and advertising that is captivating and easy to assimilate. Let's talk about fulfilling your production needs. I enjoy engaging in clear and direct communication while producing high quality design products. I've managed commercial production facilities for 15 years, producing broadcast video and audio, print advertising and a variety of promotional and informational materials. Now I'm available to work directly with you on brochures, catalogs, letterhead and business cards, logo design, DVD's or broadcast television and radio communications. I'm enthused about the opportunity to work with you and look forward to a relationship where you are delighted with the process as well as the final results.